The US and Afghanistan have agreed to speed up the transition of military control in the country from coalition to Afghan forces. President Obama has made assurances that US troops will fully shift to a “training and assisting” role. ­The leaders of both countries met behind closed doors in the White House to “review friendship” and “discussed in great details all relevant issues”. Negotiations between President Obama and President Karzai focused on US’s future role in Afghanistan and the mission of those troops remaining in the country after their combat withdrawal. Washington is planning to considerably reduce the number of its troops deployed in the country from the current 66,000 to as few as between 2,000 and 6,000. But “starting this spring”, Barack Obama said, the coalition forces “will have different mission” – “training, advising, assisting Afghan soldiers”. Obama said he would present plans for US troop drawdown’s in Afghanistan, after he receives recommendations from US military commanders over the coming weeks. For his part Karzai declined to spell out the size of a contingency force he'd like to see left behind. 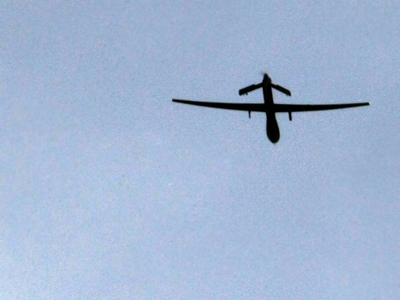 "Numbers are not going to make a difference to the situation in Afghanistan," Karzai said. "It's the relationship that will make a difference in Afghanistan." But speculation is rife that President Karzai would like to see a relatively large residual force in Afghanistan. But questions have arisen as to whether Afghanistan’s own security forces, which the US pledged to train and equip before withdrawal, will be prepared to take full responsibility. 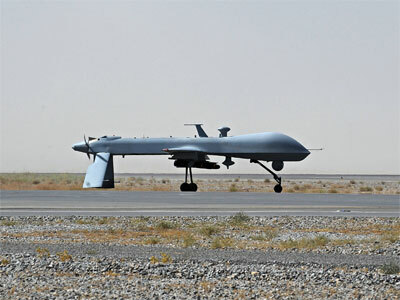 This may be particularly acute if US refuses to back Afghan forces with air and artillery support during operations, instead conducting its own independent missions, focusing on drone strikes like in Pakistan. Phyllis Bennis, from the DC-based Institute for Policy Studies, believes it is still a long way away before Afghan forces will be able to take full control. “It’s quite clear that Afghanistan is going to remain a very unstable and dangerous place for its people for a long time to come. The US years of occupation have thoroughly destabilized the country. There’s a great deal of violence… it’s going to be a very difficult time, but that’s going to be true if the US troops pulled out tomorrow or in one year, two years, ten years. That is the reality, and I don’t think the timeframe is going to change it,” she told RT. 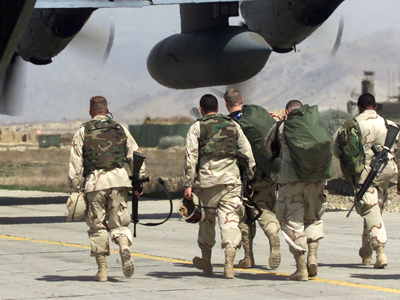 The Afghan war has become unpopular among Americans and their European allies, costing many troops lives. A spate of green-on-blue attacks and high costs during an economic slowdown, are some of the reasons highlighted by Ari Rutenberg, contributor of The Daily Banter independent political site, for dwindling support. “The domestic politics of the United States – as they often are – are the overriding factor here. The people fear the war and they don’t want to pay for it anymore. Whether or not it’s a wise decision on their part, that’s how the population feels right now,” he told RT. 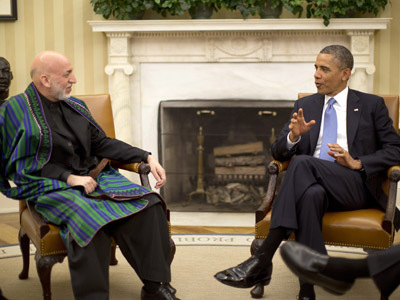 Obama and Karzai also discussed US assistance in providing aid and support for the Afghan people. The US president promised a better life for “all Afghans”, who also made sacrifices in the battle will terrorism, deserving “development, education and opportunities”. The tension is aggravated by the perception of Karzai and his government as corrupt and inefficient. Leaving him to deal with his domestic problems while maintaining a smaller footprint, which would be enough to contain Iran and China, is a tempting course of action. Kabul is at risk of losing control of a greater portion of Afghanistan territory to Taliban militants and Al-Qaeda-affiliated fighters. The country went through a similar period of warlord-driven disarray following the 1989 Soviet withdrawal and until Taliban ultimately took over. Karzai, who is to abandon office in 2014 but has not yet endorsed a successor, is left with few bargaining chips. He may take a tough position over what small presence Washington wants to keep in the country at the cost of losing financial aid from the US. It may also turn to its neighbors as potential patrons to replace America. “President Karzai is not without his resources. He has other allies in the region. The Afghan government tried to build more of a security, political and economic relationship with China, with Iran, with India,” Leverett says. Parting with the US, not unlike Iraq did in 2011, may be the course of preference for Karzai, if he fails to get enough backing. It would boost his popularity at home, where many people loathe lasting American involvement and justly or unjustly blame on them all hardships of their live. On a longer timescale, Kabul will have to negotiate a new configuration of power in Afghanistan, and bringing to common ground all the parties interested may prove beyond it.